To advance the commercial, industrial, civic and general interests of Paradise and the surrounding area. To exert positive leadership and supportive activities and to improve the general economic, social and physical condition of Paradise and the surrounding area. To cooperate with other organizations and communities in the fulfillment of the aforementioned purposes. Regularly scheduled meetings are held on the second Wednesday of the month, excluding July and August. 7:00 PM at the Paradise Area Chamber of Commerce building located at 7293 M-123. Meetings are held in the conference room located behind the visitor's center. Check the calendar for scheduled meetings. If you have any questions or concerns, do not hesitate to contact a chamber officer. Join the Paradise Area Chamber of Commerce by completing the application form. Paradise, Michigan was founded in 1925 and is situated on the western shores of Lake Superior�s Whitefish Bay just north of the Tahquamenon River mouth. After a major fire stormed the Whitefish Point area in 1922, blueberries moved in and became a staple for locals and visitors alike. Today, Paradise is the Wild Blueberry Capital of Michigan and the gateway to the Tahquamenon Falls State Parks. Paradise offers something for everyone in every season. It is a magnet for rock hounds, beach walkers, maritime enthusiasts, bikers, hikers, bird watchers, snowmobilers, four-wheelers, fishers, boaters, campers, canoeists, kayakers, photographers, nature lovers, young and old alike. In every season, wouldn�t you rather be in Paradise? Whitefish Point is a mecca for birders -- Whitefish Point is on one of the busiest migratory flight paths in the world. The Whitefish Point Bird Observatory hosts workshops and the annual Spring Fling, attracting bird-watching pros and novices alike. The acclaimed Great Lakes Shipwreck Museum at Whitefish Point opens May 1. In May, visitors to the Point enjoy a quieter experience, strolling along the agate-strewn north shore of Lake Superior. The Paradise area features miles of beaches, rivers, and trails. Before you get into town, pull over at the public access just north of the Tahquamenon River. This turnout is part of the Tahquamenon Falls State Park. Here, a sandy beach is steps from your car door and kiosks help guide your stay in the area. 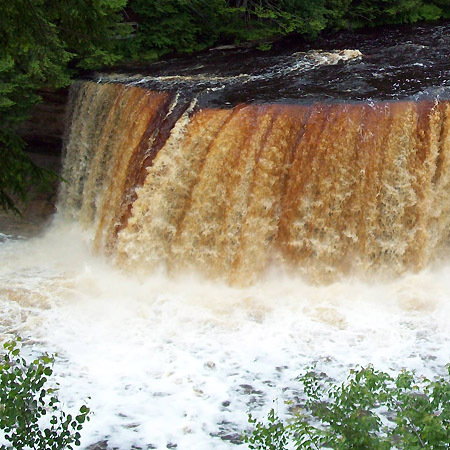 One of the most visited natural sites in Michigan is the Tahquamenon Falls. Both Upper and Lower Falls are dramatic examples of Michigan�s beauty and are visited by hundreds of thousands each year. The Whitefish Point area is known for wild blueberries, and the entire town of Paradise pitches in to host the Wild Blueberry Festival in August. This family fun festival takes place at the Whitefish Township Community Center overlooking Whitefish Bay. Hiking, biking, four-wheeling and kayaking are all favorite pastimes in the summer. Miles of off-road trails abound and hikers can explore the North Country Trail, which winds through the area. Fall color is not the only reason to visit the area. Like spring, fall is a quieter time and visitors can truly enjoy the solitude of the area. Do not miss your chance to see fresh cranberries being sorted at the Centennial Cranberry Farm. The fall migration brings birds and birders alike again to the Whitefish Point Bird Observatory . Get to places you can't in summer! Paradise is a top destination for snowmobilers, but it's also tops for quiet winter sports like cross-country skiing and snowshoeing. Rent equipment from a local merchant and hit the trails! Don't miss an opportunity to see Tahquamenon Falls in the winter -- its unique ice sculptures are fantastic and just a short walk from your car or snowmobile. Regardless of the season, wouldn't you rather be in Paradise.